Posted by Emma, who’s fooling around with things. A friend posted this image, and I absolutely love it. 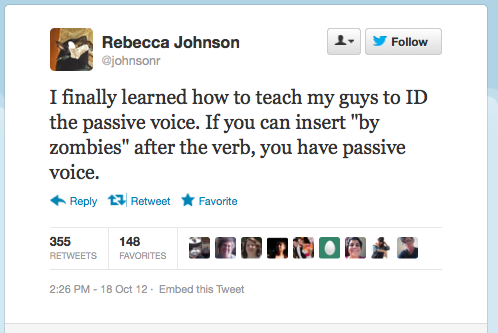 It’s the perfect example of how to avoid passive voice, which is something I struggle with when writing. Hailing from the wet and windy Scottish Highlands, Emma is an avid reader and writer of YA novels. She works in IT and drinks too much tea. Her YA Fantasy novel REBEL AGAINST HEAVEN is being revised for submission. Love this! Can’t wait for next semester to start to share with my students! This article was written on 17 Dec 2012, and is filled under Miscellany. © 2012 The Inkbots. All Rights Reserved.